Last summer, I worked on crewel embroidery projects while at the Tuesday Farmer's Market in Northampton. My stand is not very busy and I have to have something to work on or else I go bonkers. The first project I made was my Circles Sampler which I made into a kit which is for sale on my website here. My second project was a little more realistic and based on one of my favorite flowers - the sunflower. For years, I have been growing sunflowers. If you are a longtime reader, you probably look forward to seeing the photos in September and October when the sunflowers are at their peak. I thought it would be fun to turn the natural inspiration into a stitched piece of crewel work. The wool thread I use (and sell here) is the perfect texture for sunflowers. 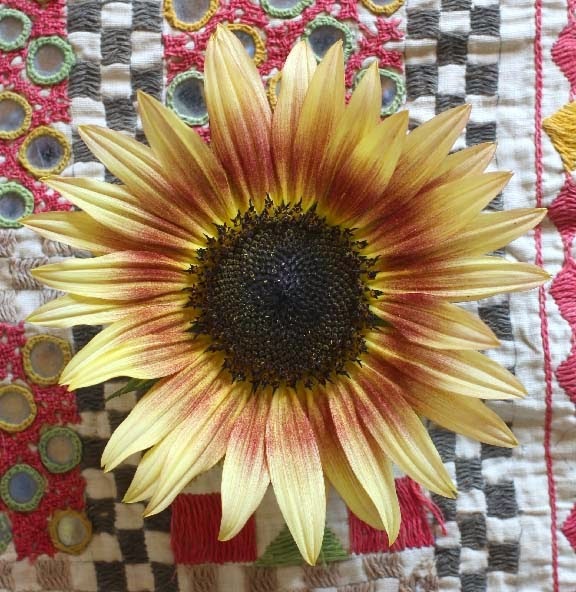 Today I am going to share with you one of the sunflowers I stitched hoping that some of you might give Crewel Embroidery a try. (I teach Crewel Embroidery on-line on Craftsy - link for 50% off on my sidebar. I am also offering an advanced Crewel Embroidery Class here at the farm in August. Info here.) I will continue the previews over the next week or so. I've also dug into my photo archives to share the natural inspiration. Let's start with a beautiful vase full of blooms from last September. Let's start with the smallest flower.... 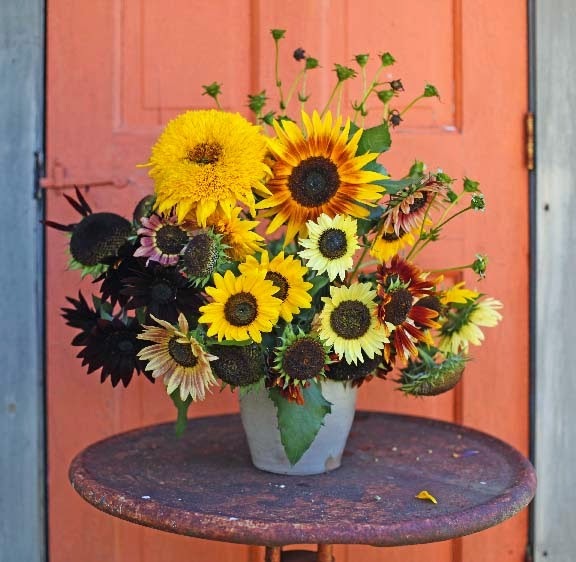 This flower was inspired by the bi-colored sunflowers called Strawberry Blonde and Pro-Cut Bi-Color. 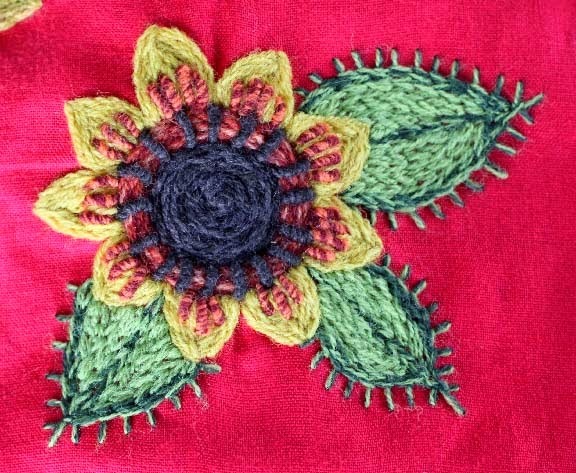 Petals were made of closely packed stem stitch as was the dark brown center. I used bullion knots to represent the multi-colored petals mixing two shades of orange in the needle. To create the puffy outside ring of the flower, I used more bullion knots over a multi-color outer ring stitched in stem stitch. Here is a close-up of those stitches. I stitched the leaves in closely packed chain stitch. 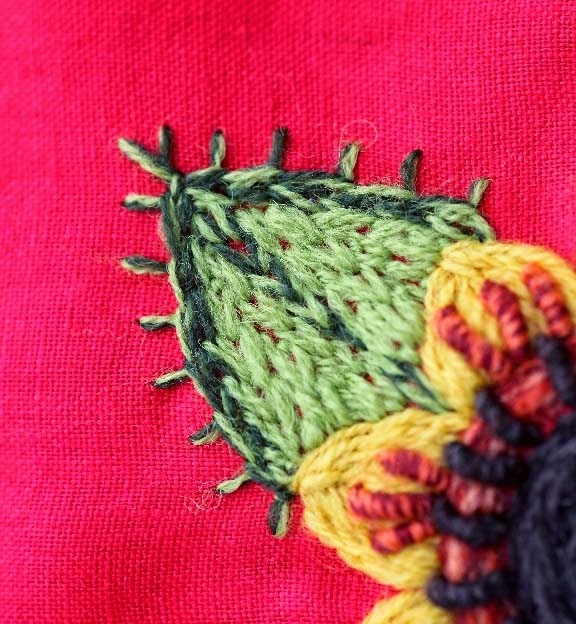 On the outside edge of the leaf, I worked an open buttonhole stitch mixing two colors of wool thread in the needle. 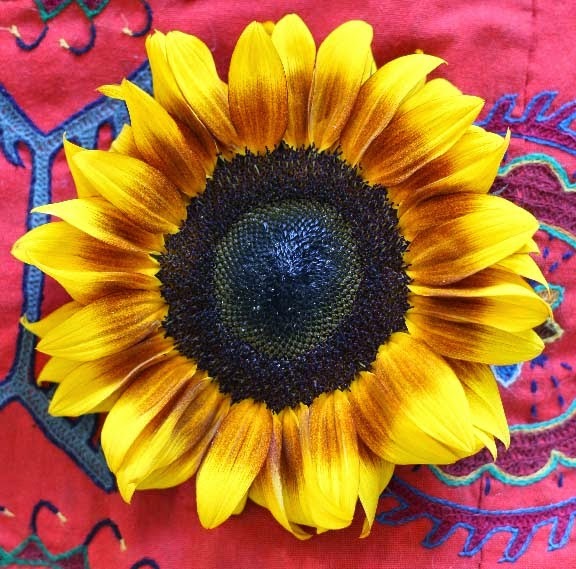 Leaves of sunflowers are usually jagged and this stitch approximated the look. There's nothing worse than working your tush off to get ready for a sale/market and then end up just *SITTING-THERE*!! - Especially, if the next booth over is selling "crap" like crazy! A "TUESDAY" market..? Does it actually get a lot of "traffic" other than 20-Something-yoga-Veggan-iMOMS jogging by with their CABBAGE-KIDS between PLAY-DATES? Anyhoo... EVERY time I see SUNFLOWERS, I *THINK* of YOU! Great commitment to color and texture. Love your work! 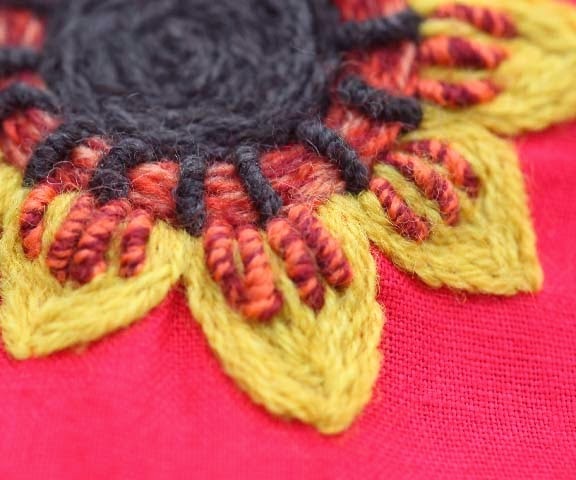 Oh I love the sunflower crewel embroidery piece! I have taken your Craftsy Class and it is the best class I have ever taken on Craftsy (and I have taken many) You explained everything so clearly and the demonstration of each stitch was great! I hope you get the chance to do an Advanced Crewel Embroidery class on Craftsy since I am to far away to take your class on the farm!